Sam Kodo: Africa’s Steve Jobs? 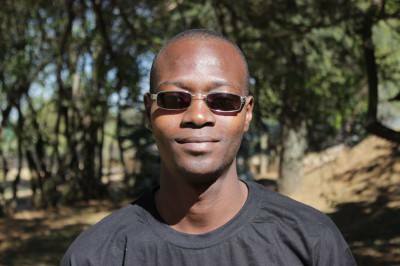 Sam Kodo is a 23-year-old young entrepreneur and changemaker from Lomé, Togo. He currently runs a technology company, LC-COM (Low cost-Computer)/ Infinite Loop, which produces low-cost personal computers for students. His biggest dream is to become the next Steve Jobs and create a new kind of Silicon Valley in Africa. The idea to create his company came when he went to University, as he noticed that many people do not have computers for work and study. During his spare time, Sam was a developer in a tech laboratory, where he worked to develop a processor. According to techtarget.com, a processor is the logic circuitry that responds to and processes the basic instructions that drive a computer. He discovered that his processor can be used as a real computer if well-programmed, thus becoming an inexpensive, miniature computer that can fit in people’s pockets and be plugged to any screen (TV/touchscreens). With $3000 won at a technological contest “Forum des Jeunes Entrepreneurs” he started his own company in 2013. Sam hopes to make his computers widely available on the Togo and African markets and to encourage the African people to consume the products made on their continent. Since an early age in his life, Sam has also been interested in robotics. By the time he was eight, he created his first robot. By fifteen, his robots could interact with humans, recognize faces and objects, speak, execute orders and even play football. Right now, his robots have the ability to feed food to domestics animals, especially dogs and cats, as well as to feed animals manually at a specific time or via Wi-Fi and Internet using a computer or mobile phone using speech recognition applications and PHP pages. He has also created smartphones and computers. Until this point in his life, Sam has built more than 20 robots. 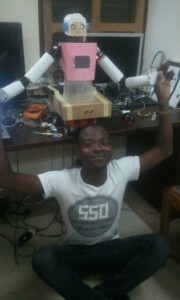 His current priority is to expand into other markets, develop the technological field in Africa, but also change lives. The young entrepreneur’s greatest accomplishment thus far is the fact that he has his own company, which is changing the lives of so many people in Togo. For him, the greatest challenge that African countries face is that electricity, technological materials and Internet accessibility are still inaccessible to a large portion of the population, mostly because the innovation is not encouraged. 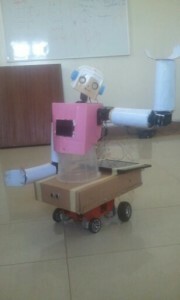 Apart from LC-COM (Low cost-Computer) Infinite Loop, during his free time, Sam is involved in volunteer activities that train young people on Robotic and programming languages like C and C++. According to African Economic Outlook, Africa is the continent that will have the youngest population in the near future, which means it will have a massive potential to grow. Sam thinks that having such a young population is the only opportunity for his continent to develop and learn, because that paves the future for the next generations by giving them a good example. Sam thinks that a young changemaker has to possess the following qualities – self-confidence, courage and the inflexible determination to success whatever happens.